The Skip Service is one of the most extendable collection services for heavy or bulky waste and recyclables. 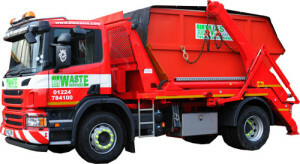 Skip Loaders are trucks designed to carry regular sized skips, suitable for the collection of both domestic and commercial waste. Once an order for a skip has been placed a skip loader will be dispatched to your commercial or residential location. You are free to fill the skip in your own time. Once filled, the skip is either replaced with an empty skip or removed to be emptied and its contents recycled. Skips can be requested on an ad hoc basis or through a hire contract and collections can either be scheduled or collected on request.